The Dagger leather vest has a pretty nice combination of features. It has a short banded collar like the Pinion and Ice Pick, which I like due to my short neck. On the sides, it has some sharp leather expansion material. If you have a bit of a belly, that material will flex and give you some room to move, but for most, its just a sharp bit of styling. Black Brand says: Built from top-grain leather and stretch side panels, the Dagger vest offers a great fit and great quality. 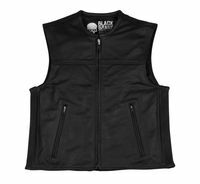 Included left- and right-side conceal carry pockets, zipper closure pockets outside the vest and and a zip-off inner liner for easy patch installation means this is a vest that will serve you for a long time.